We are ridiculously over gizmoed. The psychological studies that are the main research goals for the mission require us to fill out numerous surveys every day (at least 4). Many of these are doable on any computer but some require specific apps not all of which are available on every platform. The desk in my bedroom is an absolute rat’s nest of every possible kind of usb charger, even with how many I have, there manages to be hardly any duplicates. I almost bought a Windows tablet before I left; I’m so happy I didn’t, that was the last thing I needed. Main computer – General use. Needed something powerful enough to run the Oculus Rift and wanted a big monitor to do CAD on. I think I’m the only person my age still clinging to a desktop computer at home, but I’m happy I brought it. 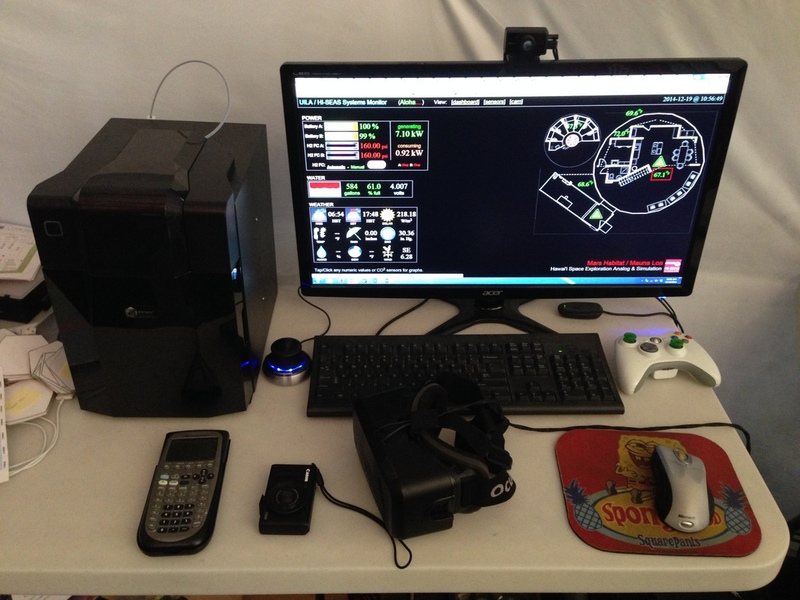 Oculus Rift DK2 w/ xbox controller – Secondary research area. The idea was to see if it could be useful in trying to alleviate the feelings of confinement that I expected to experience here. That is turning out to be less of an issue than I expected. The combination of development hardware/software, my computer being borderline for running it anyway and the lack of unrestricted internet to troubleshoot problems has meant that I haven’t really gotten it working in any fun or interesting ways. Ti-89 – What kind of engineer would I be without one? 3D printer – Main research area. In addition to the blog posts I’ve done already I’ll do more general overview of 3D printing fairly soon. 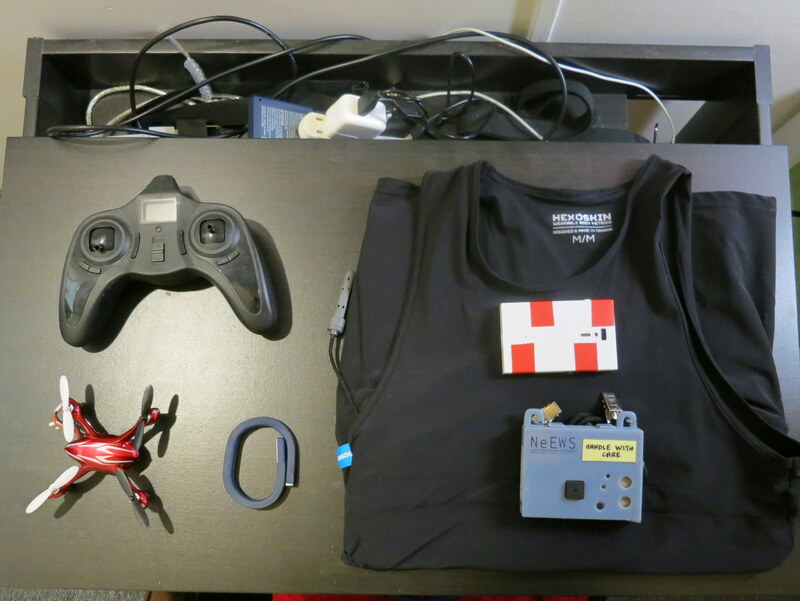 Small quad copter – Never know when you might need one. Hexoskin – Respiration and heart rate monitor. This is part of Jocelyn’s personal research. Sociometers – Boxes we wear on our chests that attempt to quantify how we interact with people. We wear these at all-times except when sleeping, exercising, showering and on EVAs. They measure things like motion, sound intensity, and proximity. For some specific tasks we also wear a second sociometer (to compare data to the first) and a heart rate monitor. Jawbone up – Movement and sleep tracker worn all the time except in the shower, Jocelyn again. Samsung Android tablet – Was initially required for curiosity task, happily I managed to get the app on my iPad and I hope not to touch it again for the next 6 months. Kindle Paperwhite – Bought this right before the mission thinking I needed something to read books on since I didn’t want to bring bunch of paper books. I was a bit skeptical about whether I would like reading on it, but I’ve read a few books on it so far and it has been great. Logitech Bluetooth keyboard – Bought this when I found out we were going to have a bunch of surveys to fill out on the tablets. It turned out that they can pretty much all be done on a computer so I haven’t used it much. iPhone – Pretty much relegated to checking email and habitat systems when my computer is off since the phone, text and most of the apps don’t work with the internet setup we have. The rest of the crew is in a pretty similar spot. 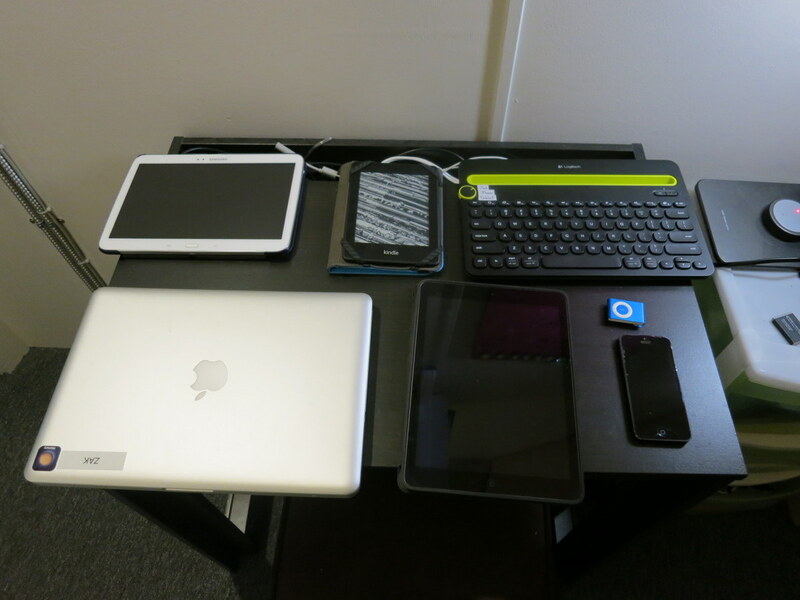 Everyone brought at least one computer of their own, plus was issued their own macbook, iPad and android tablet. There are another handful of laptops and tablets floating around for various tasks plus the ones used for the habitat telemetry system so there are about 20 computers and more than a dozen tablets in all. So, tell me; what is the total energy consumption of all this gear (your own, and then that of the others)? And what would you imagine, in the context of the sim, could the total energy consumption be reduced to, given the redundancies and other issues you mention? What do you suppose the minimum daily energy cost of these technologies (that is, the necessary functions represented by these technologies) would be? What percentage is this of a typical daily energy budget (and for that matter, what is that budget made up of, both on the input and output sides)? None of these actually have much of an impact energy wise. We have more power than we can store generated during most days that just goes to waste. We are generally pretty good about charging all these devices during the day and then running them off batteries at night. By far the largest use of energy at night (nearly half) is the heaters and fans in the composting toilet, they run 24/7. Cooking is obviously the other big energy usage and again we generally cook dinner in the late afternoon (unless it is fairly simple) and then reheat it later. ← So what are we doing here anyway?